The Moto G is already one of the best overall mid-range phones around, plus it comes unlocked direct from Motorola. But for any customer that wants to pick up a truly stripped down phone, Google has started selling the Moto G in Google Play Edition form. 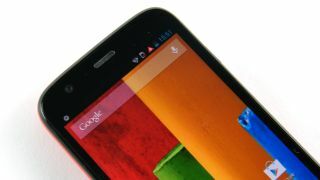 The Moto G, and its elder brother the Moto X, were created under the close eye of Google, but the Play Edition strips what little non-stock elements of Android were still there. The Play Edition comes with Android 4.4 preloaded and is available in 8GB and 16GB flavors. Of course, one of the big advantages of being a Google Play Edition handset is receiving updates early, so look for this phone to start packing the latest Android 4.x before others. Other than the stripped OS, the Moto G is still the same phone, even down to its $179 (£135/ about AU$199) price for 8GB and $199 (£159/ about AU$222) for double the storage. The 4.5-inch smartphone comes rocking a 1.2GHz quad-core Qualcomm Snapdragon 400 processor with 1GB of RAM. Even though the handset only houses a 1280 x 720 resolution screen, at 329ppi it just beats the 326 pixel per inch density display on the iPhone 5S. The only truly budget quirks about this phone are the 5MP rear camera and the fact that it only has a 3G antenna. It's definitely not a handset for data speed lovers. We go hands on with the Lenovo Y50, one of the first 4K gaming laptops around.